The Swedish elections take place on 14 September. As polls stand, the sitting centre-right coalition government, “Alliansen” – the Moderates, Centre Party, People’s Party and Christian Democrats – look set to lose to a leftist coalition of some sort. The big question might be who the Social Democrats – the biggest party in the polls – decide to rule with: the Green Party is the most likely partner, but the Left Party could be in the mix too. There’s even talk of the Social Democrats reaching across the aisle to form some sort of ‘grand coalition’ – which would break with tradition. It may not be that easy for the Social Democrats to agree economic policy with the Greens and Far Left, both of which are, well, pretty far to the left. In the latest Ipsos poll, the three left parties together muster 50.4%, whilst Alliansen is on only on 35.6%. 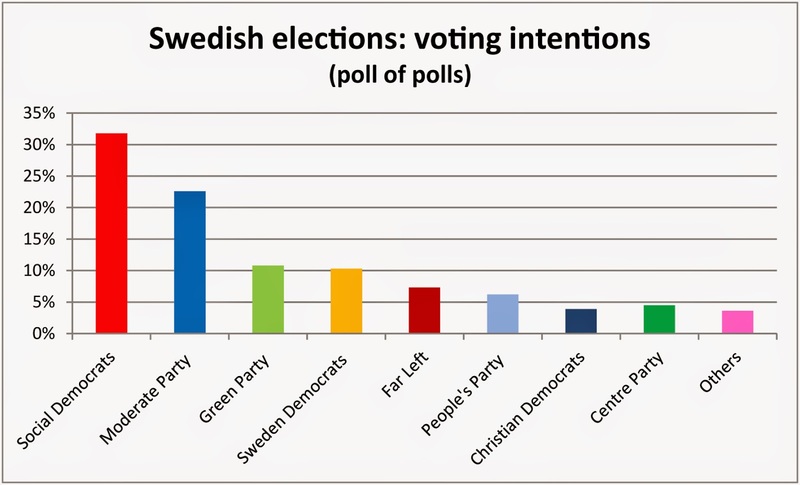 At the same time, the anti-immigration Sweden Democrats have gained steadily in the polls, and it is now the fourth most popular party in the country on 10.3% (it made the Parliament for the first time in 2010, on 5.7%) according to the poll of polls – breathing down the neck of the Greens, on 10.8%. This despite Swedish media really having turned up the heat on the party over the last few years – often deserved but at times hysterically and counter-productively (the Swedish establishment hasn’t quite yet grasped the ‘metropolitan elite is ganging up on us’ narrative that is doing so much for anti-establishment parties across Europe). That’s worrying news for those of us who want Sweden to remain a liberal and outward-looking country.